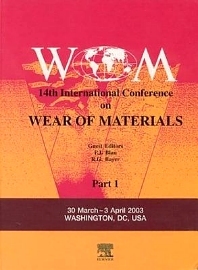 The 14th International Conference on Wear of Materials took place in Washington, DC, USA, 30 March - 3 April 2003. These proceedings contain over two-hundred peer reviewed papers containing the best research, technical developments and engineering case studies from around the world. Biomaterials and nano-tribology receive special attention in this collection reflecting the general trends in the field. Further highlights include a focus on the new generation of instrumentation to probe wear at increasingly small scales. Approximately ninety communications and case studies, a popular format for the academic community have also been included, enabling the inclusion of the most up-to-date research. For tribologists and lubrication engineers, mechanical engineers, production engineers and industrial designers, materials scientists in metals, polymers and ceramics, physicists and chemists in surface analysis.